Global Business and German double major Nathan Jones '20 sits in front of the Reichstag building in Berlin, Germany, where he studied abroad in the summer of 2017. 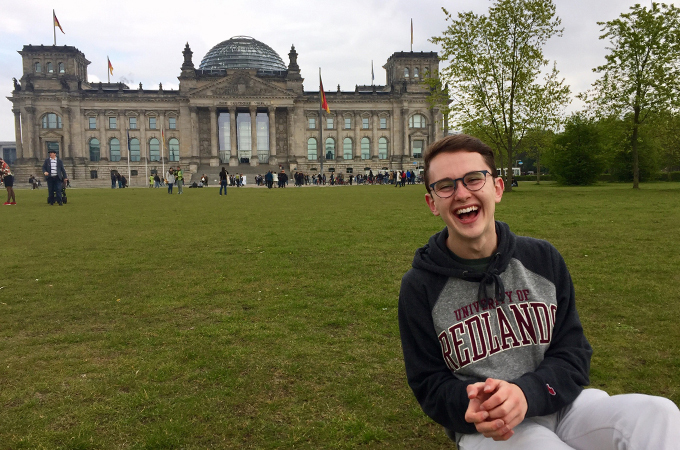 As a double major in global business and German at the University of Redlands, I originally chose Berlin for its modern, city appeal blended with a rich cultural history, knowing Berlin would teach me more than I could imagine, both inside of the classroom and out in the city’s various districts. Going abroad for the first time was daunting. It felt similar to moving into my dorm during orientation week and wondering “Will I make any friends?” and “Will I perform well in my classes?” On my flight to Germany, I distracted myself from my nervousness with books and fueled my excitement by daydreaming about living out a stereotypical, European summer I had only seen in movies. In the morning I woke up and took the U-Bahn (with plenty of help from Berlin locals) to the Berlin location of the Goethe-Institut—a language school (Sprachschule) that teaches German worldwide. Soon, all my worries were alleviated. My teachers at the Goethe-Institut were welcoming and my classmates were so friendly that forming deep bonds with them came easily. After my first day of class, I found myself on Neue Schönhauser Straße with new friends and endless possibilities in my day until homework that night. We chose a direction and trusted each other that we would find our way. That afternoon, I saw famous Berlin landmarks—such as the Berlin Cathedral, Brandenburg Gate, and Reichstag building—in person for the first time and visited a café that would soon become my own personal hub for schoolwork, rainy days, and relaxation. My time at the Goethe-Institut, naturally, acted as a catalyst for my understanding of and confidence in German, but it also taught me an important lesson I can apply to any new experience or opportunity: being nervous can be a good sign. In reflection, my nerves leading up to my studies in Berlin were so strong because I was passionate about the work I was about to immerse myself in. Now, I’m finishing my second year at the University of Redlands and preparing my next trip to Berlin. The Harris Summer Opportunity Scholarship, a new award for Global Business students pursuing internships in marketing and/or fashion, enables me to work as a marketing intern in a German work environment, an experience that will prepare me for an international career after I finish my undergraduate studies. Last year, eight weeks sounded like a lifetime away from home; however, this time, I understand how fast time will pass when I’m in a city I love, working in an environment and field I’m passionate about, so I look forward to making the most of my time in Germany this summer. Naturally, I’m excited to go back to my favorite café and reconnect with its employees, but I also can’t wait to explore parts of the city I missed last time with new friends. Berlin always has something new waiting around the corner and the summertime is a perfect opportunity to be as immersed in as much of the city’s culture as possible. I can’t even begin to express my gratitude to the Global Business Program at the University of Redlands because my experiences, both this summer and last, wouldn’t have been possible without the array of scholarships available to global business majors. These resources make the world our campus and help me feel ready to prove myself as a Bulldog back in Berlin. Learn more about study abroad and/or the global business major at the University of Redlands.